Visiting waterfalls in North Carolina State Parks is one of the most exciting and memorable experiences you can have! As such, waterfalls sometimes cause visitors to forget basic safety measures. People are seriously injured and killed at waterfalls in our state every year. By following these rules, you can help keep you and your family safe. Stay on developed trails and don't stray from observation decks and platforms. Pay attention to the warning signs and rules you see posted near waterfalls. Never climb on or around waterfalls. Rocks are more slippery than they look. Never jump off waterfalls or dive into plunge pools. Rocks and logs are often beneath the surface of the water but difficult to see. Currents caused by a waterfall can drag and keep you underwater. Watch children carefully. Children should always be under the immediate supervision of adults when visiting any falls. Pets should also be supervised. They can easily underestimate the slickness of rocks and the flow of water. Never play in the stream or river above a waterfall. You can easily be swept over the falls by currents. 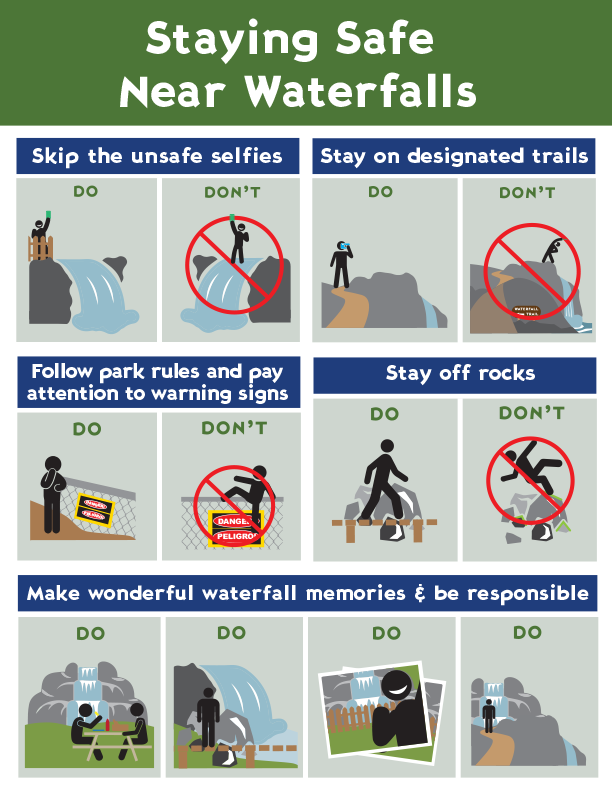 Do not try to take photos or selfies at the top of a waterfall! People lose their footing while paying attention to their photo set-up and fall over. Slippery rocks and mud are common along trails as you near waterfalls. Use extra caution on the trail as you approach waterfalls. Since many waterfalls are in remote areas, a medical rescue could take hours. Wear hiking shoes with a good grip. Flip flops and sandals make you particularly vulnerable to slipping or injuring yourself. Bring a picnic or snack and plenty of water. Reaching some waterfalls in your state parks require a challenging hike! Plan ahead to ensure you will be back to your campsite or parking area before sunset. Winter is an exceptional time to visit waterfalls in North Carolina State Parks as trees drop their leaves and reveal sweeping views. Watch for icy patches along the trail and on decks and overlook areas from the mist of the waterfalls. For a full list of North Carolina State Parks rules, please click here. Take Care, Be Safe and Enjoy NC State Parks from North Carolina State Parks on Vimeo.